BLAEU - Americae Nova Tabula. Size : 16.0 x 22.0 inches. / 40.6 x 55.9 cm. 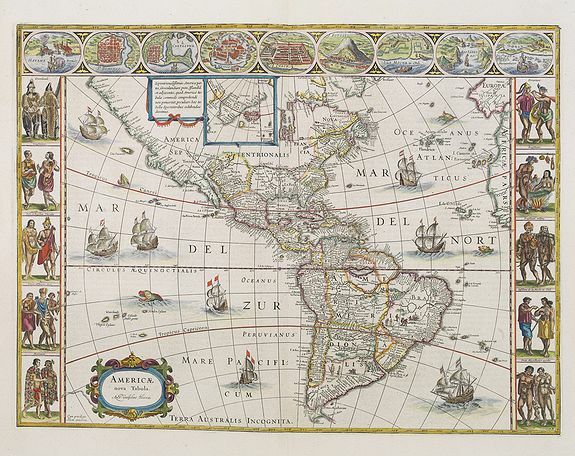 Description :The delineation of the coast and the nomenclature on both the Pacific and Atlantic coasts are basically Spanish in origin and follow the maps of Ortelius and Wytfliet. To these Willem Blaeu has inserted on the East Coast the English names given by the Roanoke colonists in Virginia and by Frobisher, Davis and Hudson to the far north. He has added French names in Florida and along the St Lawrence. European geographers still had no knowledge of the extent of the Mississippi. From the expedition journals of De Soto (1539-43) they had inferred an extensive range of east west trending mountains north of the Gulf of Mexico, precluding any great river system. Condition : Printed on heavy paper. Generally very fine condition.